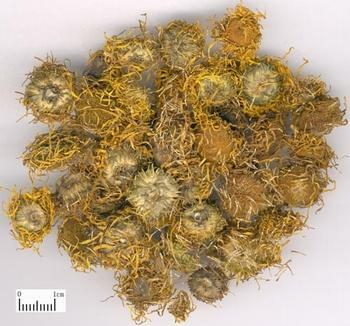 The dry capitulum of perennial herbaceous plant Inula japonica Thunb. or I. britannica E. of family Compositae. Henan, Hebei and Jiangsu provinces in China. Collected in summer and autumn when blooming. Light smell and lightly bitter taste. Complete flower, yellow and green. Unprocessed or processed with honey. Bitter, pungent, lightly warm; Lung and stomach meridians entered. Direct qi downward and resolve phlegm, check adverse flow of qi and stop vomiting. This herb is good at directing qi downward and resolving phlegm to relieve cough and dyspnea with the action of removing stuffiness and fullness. For cough and dyspnea due to cold-phlegm, it is combined with lung-warming and phlegm-resolving antitussives such as Ban Xia, Bai Jie Zi and Su Zi. For hear phlegm, it is combined with cold and cool herbs such as Zhe Bei Mu, Gua Lou and Zhu Ru to clear heat and resolve phlegm. When accompanied with cough and profuse phlegm caused by wind cold invasion, it is combined withwind-cold dispersing herbs. For instance it is combined with Jing Jie in Jin Fei Cao San from Lei Zheng Huo Ren Shu (Classified Cure Book). This herb is also good at directing stomach qi downward to relieve vomiting and belching. For constant vomiting and belching resulted from turbid phlegm obstruction of middle energizer and adverse rising of stomach qi, it is combined with damp-drying and phlegm-resolving herbs and adverse flow of qi-checking and vomiting-stopping herbs such as Ban Xia and Ju Hong. For middle qi deficiency and turbid phlegm obstruction manifested by stuffiness and hardness of epigastrium and constant belching, it is combined with middle-warming tonics. For instance it is combined with Ban Xia, Sheng Jiang and Ren Shen in Xuan Fu Dai Zhe Tang from Shang Han Lun. Decoct with wrapping, 3~10 g.
This herb has villi that stimulates throat and causes bucking and vomiting. So it should be decocted with wrapping.